Rows of wooden shelves weighted with glass jars full of summer’s wonder filled my mother’s cellar. Fleshy peaches halved in heavy syrup, white pears in blue quart jars, bing cherries in sweet red liquid lined the rows. Orange marmalade, grape jelly and strawberry jam waited in dozens of baby food jars, ready for gifts to the milkman, the mailman, the elderly neighbor, the church ladies who drove Mom to choir. Green tinted pints of bread and butter pickles, which appeared at holidays in a divided glass serving dish with black olives, filled one section. One year, homemade root beer, after many hours in the sun, exploded in the dark basement, coating the wooden shelves with yeasty sugar-fizz. Mom wasted nothing. My brother and I picked yellow dandelions from the spring lawn and Mom added dandelion wine to her stores. Quarts of stewed tomatoes, green beans and squash fed us through long winters when Dad’s construction jobs were scarce. Stones weighed down boards in barrels fermenting dill pickles and sauerkraut. Now, the translucent glass jars sparkle empty and I am full of memories. 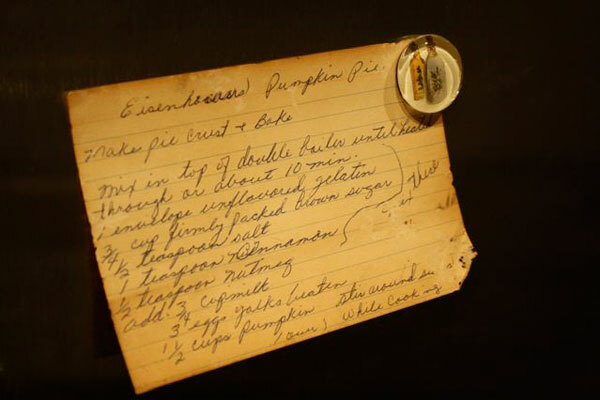 Mamie Eisenhower’s pumpkin chiffon pie ushers in the holiday season. My mother passed it on to me. Now my son Daniel and I make pumpkin chiffon pie every Thanksgiving. A landscape develops in the mixing bowl as we add ingredients. Pumpkin forms a mountain, surrounded by a river of egg yolks. It snows as we add sugar to the orange-yellow mixture. I’ve never seen this pie anywhere else. It ties me to Mom as surely as an umbilical cord, and my son to me. 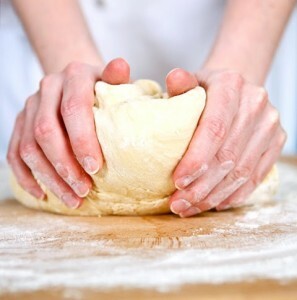 We speak our heart’s song in the kneading of bread. In a circle we sing. We women sing our mother’s songs. We sing their recipes from faded, red Betty Crocker books. We mix flours in silver and porcelain bowls infused with their memory. The warm smell of yeast fills us. Flour floats on the air. Each of us singing our own song and baking cakes to honor the Queen of Heaven.